I was heading south on Greene Street from Houston, after checking out Moss, the coolest contempo home furnishings store, and going to that horrible post office with the insanely rude "I can't be fired" management, when I noticed something new. 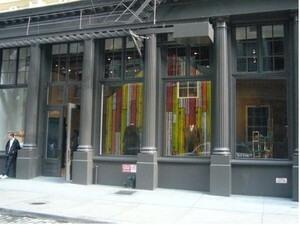 A great big new Paul Smith store had opened very quietly, more or less across the street from Kelley & Ping. I went inside and, before I knew what hit me, I'd bought three ultrahip new shirts: two florals and one sort of op art. I sense a bit of 1967 in the air, especially there. It's a great store, and it's huge compared to the one on Fifth Avenue which is smaller than some people's closets. This is the best menswear news in ages. And the new suits and shirts and socks are really great. They even have a big selection of great books. I picked up the Mondino guitar book as a birthday present. I wish their wide ties were a little thinner or their thin ties were a little wider, but why nit pick: This is one of the best men's shopping experiences in New York. 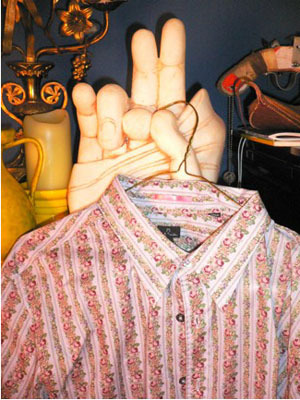 Here's one of my new shirts (displayed in my living room). Maybe I'll start a band.